​​​​Carbon monoxide (CO) is a poison gas that is a by-product of appliances, heaters, and automobiles that burn gasoline, natural gas, wood, oil, kerosene, or propane. It has no color, no taste, and no odor. Unintentional carbon monoxide poisonings account for approximately 400 to 500 deaths (all ages) and more than 15,000 emergency department visits in the United States annually. When your child breathes CO, it harms the ability of his or her blood to transport oxygen. Although everyone is at risk for CO poisoning, it is particularly dangerous for children because they breathe faster and inhale more CO per pound of body weight. The American Academy of Pediatrics (AAP) encourages families and communities to work together to protect children against carbon monoxide poisoning, especially in times of a crisis or disaster. The risk of carbon monoxide poisoning increases after disasters when gasoline- or diesel-powered generators may be more frequently used to supply power. Install battery-operated or battery back-up CO detectors near every sleeping area in your home, and check them regularly to be sure they are functioning properly. Carbon monoxide detectors that meet the UL standard 2034, when used properly, may provide early detection and warning and may prevent unintentional carbon monoxide related deaths. The largest group that suffers from CO poisonings are homeowners. Reduce your family's exposure to CO by following the recommendations below. Forced-air furnaces should be checked by a professional once a year or as recommended by the manufacturer. Pilot lights can produce CO and should be kept in good working order. Fireplaces and woodstoves should be checked professionally once a year or as recommended by the manufacturer. Check to ensure the flue is open during operation. 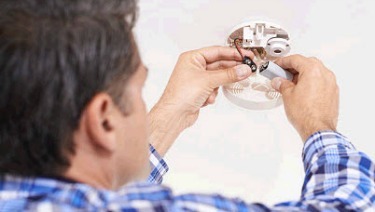 Proper use, inspection, and maintenance of vent-free fireplaces (and space heaters) are recommended. Never use barbecue grills or hibachis indoors. Never use barbecue grills or hibachis in poorly ventilated spaces such as garages, campers, and tents. Never leave an automobile running in the garage or other enclosed space; CO can accumulate even when a garage door is open. When the power goes out, keep your generator outside. Portable back-up generators produce CO.
Be aware that CO poisoning can mimic symptoms of sea sickness. Consider installing a CO detector in the accommodation space on the boat. Never swim under the back deck or swim platform as CO builds up near exhaust vents.